Leaf peeping. This is really the main thing. The colors are incredible. Go for a walk at sunset, and your mind will be blown. Hiking. There are endless possibilities, from easy dayhikes to serious backpacking. 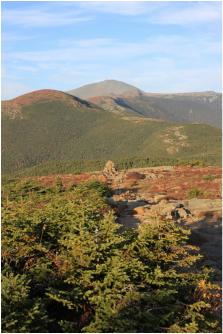 Pinkham Notch (location of trailheads for Mount Washington and nearby hikes) is a 15-minute drive away. Rock climbing and scrambling at Cathedral Ledge. Mountain biking or road biking. Alpine Slide and Mountain Coaster at Attitash Mountain. The Ghoullog at Cranmore Mountain. Outlet shopping (if you like that sort of thing). They all have sales for Columbus Day weekend. For the train buffs, Conway Scenic Railroad or Mount Washington Cog Railway. Hanging out on the porch or around the fire, drinking beer and toasting marshmallows (if you like that sort of thing).